When it comes to sports and leisure activities in Kashmir, golf is an all-favourite activity loved by people of all age groups. Its verdant meadows and pleasant weather conditions not only captures the fascination of nature lovers and honeymooners, but equally attracts sports lovers too. Golf in Kashmir was introduced first by the Britishers and thenceforth, it is enjoyed by most of the tourists. Enriching the wealth of golf tourism in Kashmir, there is various golf venues located all across the region. The golf courses in Kashmir not only reflect the natural allure of the place but are also outfitted with modern infrastructure and facilities. Travelers can enjoy this sport during summers from April to November. Among the various courses, Kashmir Golf Club is the oldest golf course sprawling over an area of 52 acres. It is an 18-hole course and provides fantastic views of famous Shankaracharya Temple and Suleiman Hills. 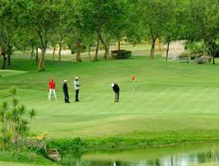 Visitors can even enjoy golf in Pahalgam and Gulmarg as each destination has its own beautifully crafted golf course. Besides these, Royal Spring Golf Course in Srinagar is a notable name among golf lovers in India. Spread over an area of around 300 acres, this 18-hole golf course provides wonderful and challenging landscapes to enjoy the game at all levels.